Since we have lots of apples leftover from our apple-picking adventures, I have been trying to do as many different kinds of recipes as I can using them. 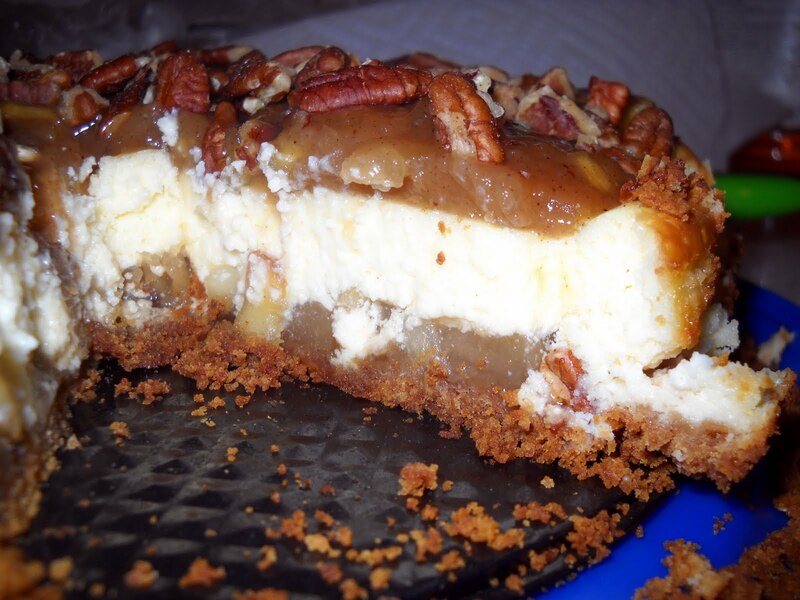 The night before last, I made a caramel apple cheesecake. Do I even need to explain this one??? It was absolutely delicious! Jon has been giving me a hard time, as it was his idea to do the cheesecake. I wanted to do an apple tart. But I must admit that I am very glad that I went with his idea to make the cheesecake. It was amazing! The recipe I found was courtesy of Paula Deen from Food Network. 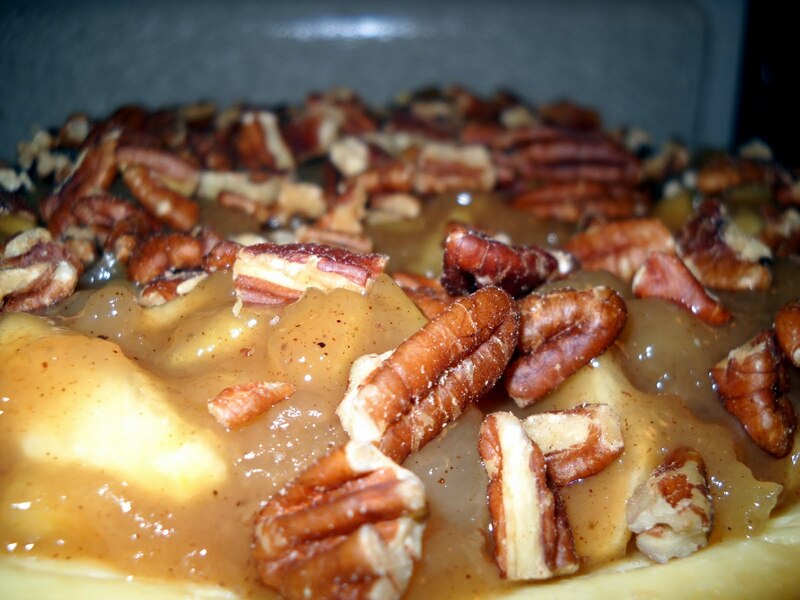 However, since this recipe called to use apple pie filling and I wanted to use my own apples, I just made my own apple pie filling and used very little of the canned stuff. Using fresh apples makes a big difference (in my opinion). If you would like to use your own seasoned apples, just slice some apples and stick them in a ziploc bag. I added pumpkin spice (since it's ingredients are cinnamon, ginger, nutmeg, allspice, mace and cloves) and I also added sugar, then let it sit in the refrigerator for about an hour. Adding sugar to fruit draws out their juices so you have the liquid along with the fruit. But using store bought apple pie filling, still makes it taste amazing so no one will blame you if you use a short cut! They won't even know a difference! :-) I didn't use the halved pecans to decorate the sides...just the chopped pecans sprinkled on top. I also made my own graham cracker crust using cinnamon graham crackers, melted butter and a 9-inch round springform pan. OMGosh that looks so good! I will have to try this out for sure! Thank you for the follow on my blog! I LOVE your blog. 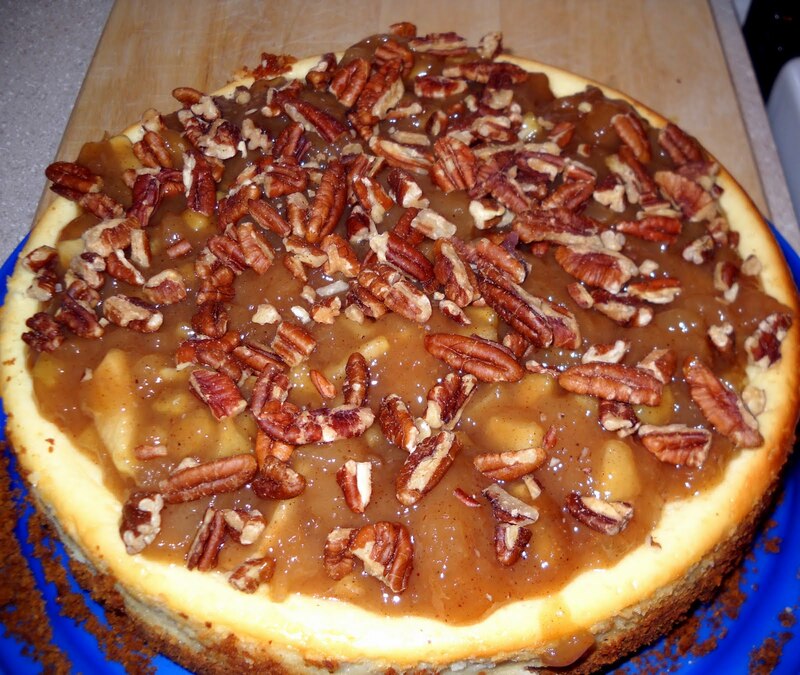 Your daughter is adorable and this Caramel Apple Cheesecake is absolutely devine! I also have digital scrapbooking software (for about a year now) and just started to use it. I am trying to put books together for my mom and in-laws for Christmas. I am your newest follower and can't wait to read more. Looks amazing! Just might give that one a try! Thanks for the follow, following back now! Hello! I am your newest follower from a Thursday Blog Hop! I would love it if you would follow back at one or all three of my blogs! WOW!!! Cheese cake looks divine. Your daughter is so cute and you got another happy follower.